A simple seasonal cocktail for the Fall and Winter holidays. 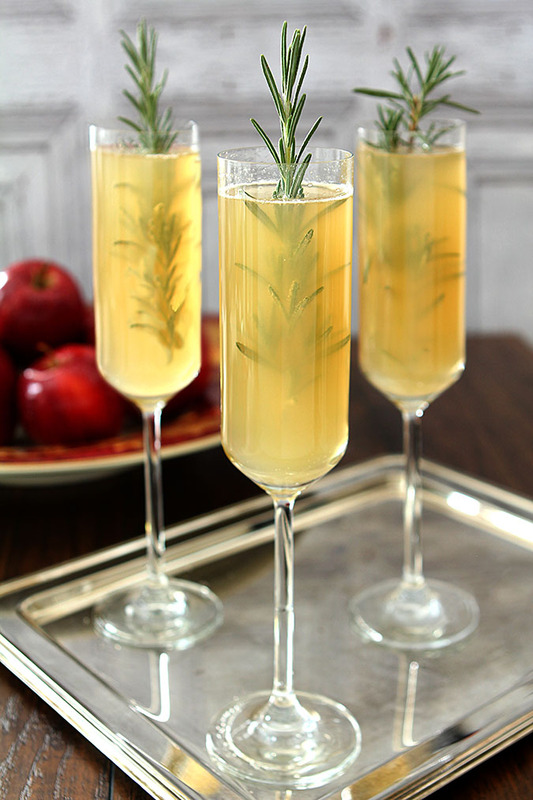 This Apple Cider Bellini with Rosemary is so easy and just perfect for breakfast, brunch or your holidays meals. Yes, Friday Cocktails on Saturday again. I could have but it was late before I finished so hope you won’t think I’m a total slacker. I’ve been in the process of painting a huge table in my family room and I admit, it took precedence. But it’s done and I love it and I’ll share photos once I have it decorated! I have a plethora of apple cider cocktails on the blog; I simply love the stuff (checkout more at the end of the post). So this week I thought one a bit more celebratory would be good as we head into the Thanksgiving season. Although I’ve done my share of apple cider everything, I held off on this one because I thought it would be perfect for a holiday celebration. Flavors of the season with a touch of bubbly; really how much more perfect is there than that? I’ve already been going nuts with listing what to serve for Thanksgiving. Although I’ve got a couple of new dishes I’ll be sharing over the next two weeks; I’ve got a couple of tried and true favorites that never get left off the menu. 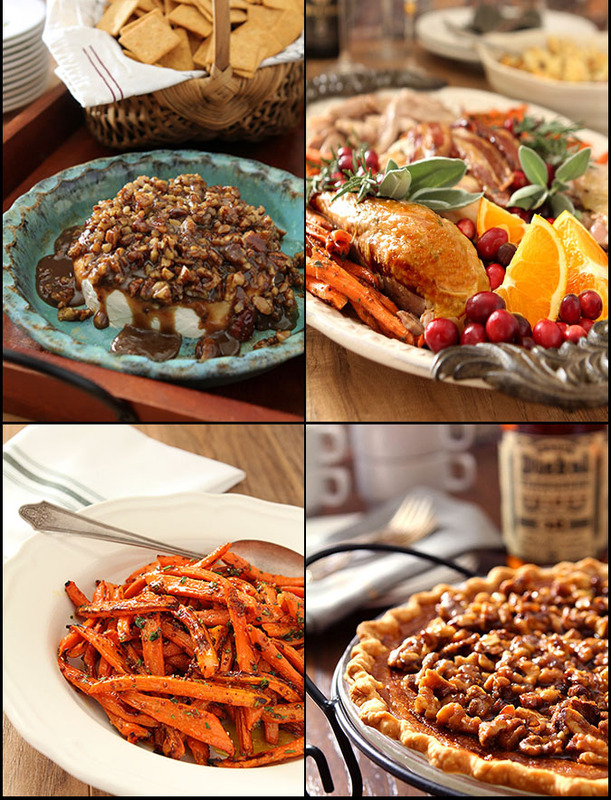 Included will be one of my favorite appetizers, this French Quarter Cheese Spread, the amazing Maple Roasted Turkey with Bacon and Cornbread Stuffing, some easy and delicious Carrots with Honey and Herbs for a side dish, and a Pumpkin Pie with Toasted Walnuts and Bourbon. No family on hand this year so I’ll be sharing with friends and neighbors at a ‘Friendsgiving’ the day after Thanksgiving, which I love. Everyone brings a dish they love and my cooking is kept simple and not overwhelming. Even though I wish my girls were here, without them, I’m taking the day off. I’m not cooking or entertaining; I’m decorating for Christmas instead. I never have enough time to get it all done so I’m going to make a day of it. Watch a parade, have an Apple Cider Bellini and probably have neighbors drop in for some appetizers before they head to their family celebrations; all while trimming the tree and setting up my Christmas Village for the first time in years (enter the newly painted aforementioned table). I could add I want to paint my bedroom furniture but let’s get real…that so is not going to happen until after the holidays! 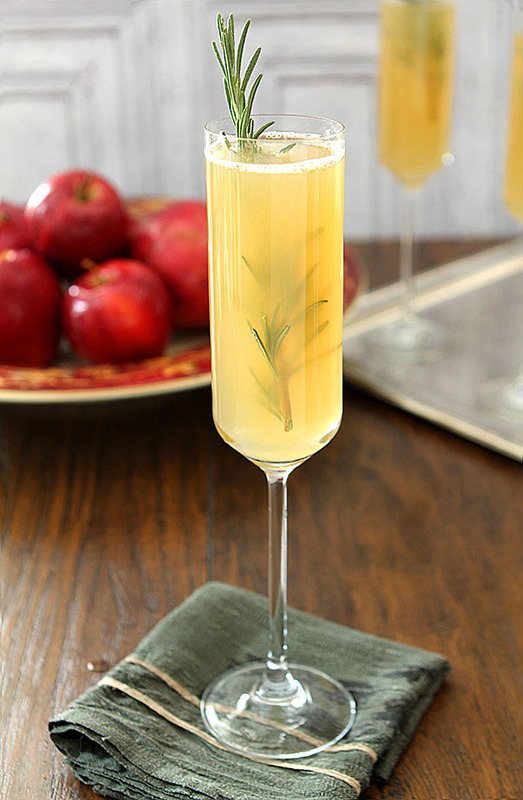 As for this cocktail; this Apple Cider Bellini is easy and festive and light and something you could either start the day with or save until dinner. Either way it’s got a combination of ingredients that just scream fall and they go down very easily. I know this for a fact. In order to get a photo I kept sipping from the glass with a straw and then filling it up again to get some fizz. It wasn’t a great fizz day but maybe that’s because when the cork came out, so did a lot of that fizz! I don’t usually have that problem but losing all those bubbles was not good. So…you’ll have more bubbles, and I’ll be envious but that will only add to the beauty of this drink. Hope you all have a very safe and wonderful holiday; Happy Thanksgiving! Combine apple cider, orange liqueur and maple syrup in a cocktail shaker filled with ice. Shake until container is thoroughly cold. Pour mixture into champagne flutes and top with the chilled Prosecco. Garnish each glass with a sprig of rosemary. Want a Mocktail? Easy. just substitute the Prosecco with some sparkling water. Apple cider drinks are SO GOOD, aren’t they? Neat idea for a drink — looks really refreshing. And of course awfully good. Thanks! I obviously love them don’t I? I love cider although I’ve never cared for apple juice… I guess I like that body that it has. This one is really good and nicely seasonal.